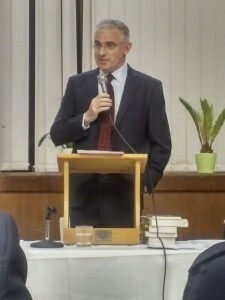 In front of a packed hall of over 250 people, including Lord Balfour (great great nephew of Arthur Balfour), Lord Kestenbaum (chair of the Balfour 100 committee) and Lord Turnberg (who initiated the recent Balfour debate in the House of Lords), Taub gave a wide-ranging lecture, drawing on a range of diplomatic and literary sources. Taub, who currently works as Director of Strategy for the Yad Hanadiv (Rothschild) Foundation, was given access to the Rothschild archives and shared some behind the scenes insights about the intriguing background to the Declaration. In the course of the lecture Taub identified a number of lessons which had relevance for today. One was that history was not carved in stone, but that it remained open to us to shape and influence it. “The Balfour Declaration was precisely that,” he said, ” – a declaration, not a binding document. As Lord Balfour himself said, ‘it didn’t give a land. It gave an opportunity.’ We were blessed to have had a leadership who knew how to seize this historic moment”.